No Guts, No Heart, No Glory on BBC4 ! No Guts, No Heart, No Glory will be on BBC4 on November 15th 2015! Common Wealth has been commissioned by the BBC and Battersea Arts Centre with funding from Arts Council England to create a live version of No Guts, No Heart, No Glory for the LIVE FROM TELEVISION CENTRE series. Four independent companies and theatre makers will perform as part of the two-hour programme, with a fifth featuring exclusively on BBC iPlayer. No Guts, No Heart, No Glory is based on interviews with Muslim female boxers and explores being young, female and doing the unexpected. Common Wealth are so proud to have this platform because from day one we made this play to challenge media representations of Muslim women in the media and now we’re on the media!! Against a context of rising Islamophobia, we need positive representations of Muslim young women more than ever. 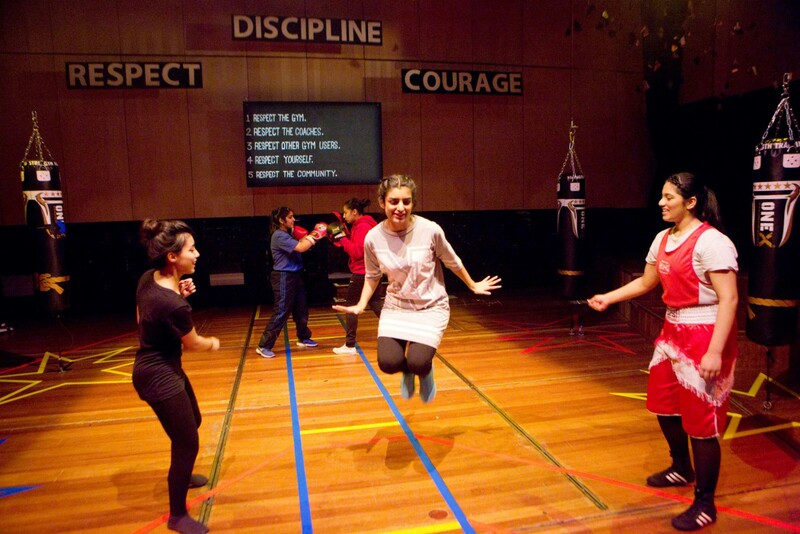 No Guts, No Heart, No Glory is an unashamedly positive piece that cuts through stereotypes and myths that surround Muslim women with one clear metaphor of boxing and in doing so celebrates young women and what they can achieve. The message communicates to all ages and backgrounds – if you have a dream, go for it, never back down. Being on TV is an amazing opportunity to speak to people across the UK. We see our plays as campaigns and ways of getting people talking, No Guts, No Heart, No Glory has always felt like a movement that encompasses more than just our five characters and we hope it will connect with people across the country. The performances will all be filmed in the iconic Television Centre complex (the headquarters of BBC Television between 1960 and 2013) for the BBC’s first live broadcast there since 2013. LIVE FROM TELEVISION CENTRE is part of the BBC’s ‘On Stage’ – a season of programming across the BBC that celebrates all of Britain’s incredible theatre talent, from world-class actors to cutting-edge regional theatre.